bill bokey wrote: Jim, how about speaker impedance ? Does the requiered voltage vary with impedance ? Also, does the wiring (series vs parallel) matter ? I want to break in a pair of 60W / 8ohm speakers. They'll be wired in series in the combo, but should I wire them in parallel for the break in procedure ? Series wiring takes twice as long, run them in parallel. I would set your variac at 11 volts maximum. Two hours on, 1 hour off, run them for 20 hours total. How about a 4x12 cab ? What's the best way to break in the speakers ? Wire them all in parallel or leave them in parallel/series ? You can do it either way, but all in parallel is 2X faster. That's how my 4x12 FBI boxes are wired. OK, makes sense. About the voltage : should it be 9V x number of speakers ? ie 36V for a 4x12 ? bill bokey, NO! I would not run the voltage any higher than 12-13 volts, and only if you are putting that with four 65w or higher speakers. In my testing that's the safe limit to avoid frying the voice coils. If you are breaking in 20-25w speakers I'd run the variac at 8-9 volts. 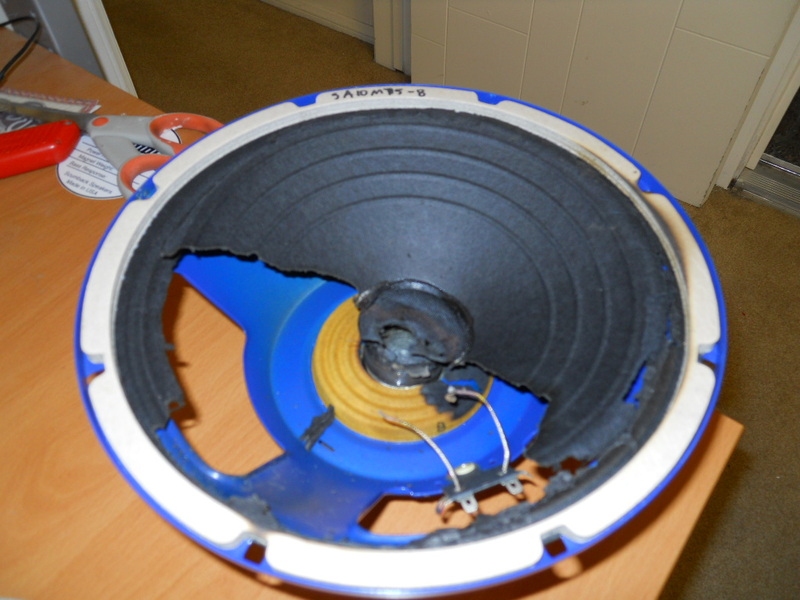 If you run the variac too high for the speaker's power handling this is what happens. There was a lot of smoke in the shop with this 10" speaker run at 9-10 volts overnight. This happened even though the variac was on a digital timer set to run for two hours on and one hour off. As you said you measured 36V out of your 50W amp I thouhgt that was the right voltage for 4 speakers. The cab I have to break in is a Marshall 1960 AHW, loaded with G12H speakers so I'll go with 9V. 36 volts was the 50w Plexi clone (Barney, my purple head) at 10 on the volume knob. That's about 90-95w cranked. You don't want to break in speakers at that volume for 24 hours, bill. The steady state signal should be no more than 12v for 65w speakers, 9v for 20-30w speakers.